For the completely uninitiated (That’s okay! We’ve all been there! ), Svengoolie (Svengoolie.com) is what’s referred to as a “horror host.” He shows a horror film, and has fun with the film. Of course, there’s a healthy dose of comedy in every show (including parody songs! ); Sven also shares trivia, showcases mail, photos, drawings, and other various gifts viewers have sent to him or given to him directly at one of his many public appearances, and more. The films he hosts are all over the spectrum in regard to era, genre, production value, and, of course, quality. But through it all, Sven is having fun, and, as a result, so are we. My point is: I write about Mr. Goolie a lot. I admit it. But it’s with good reason. Okay, it’s with many good reasons. 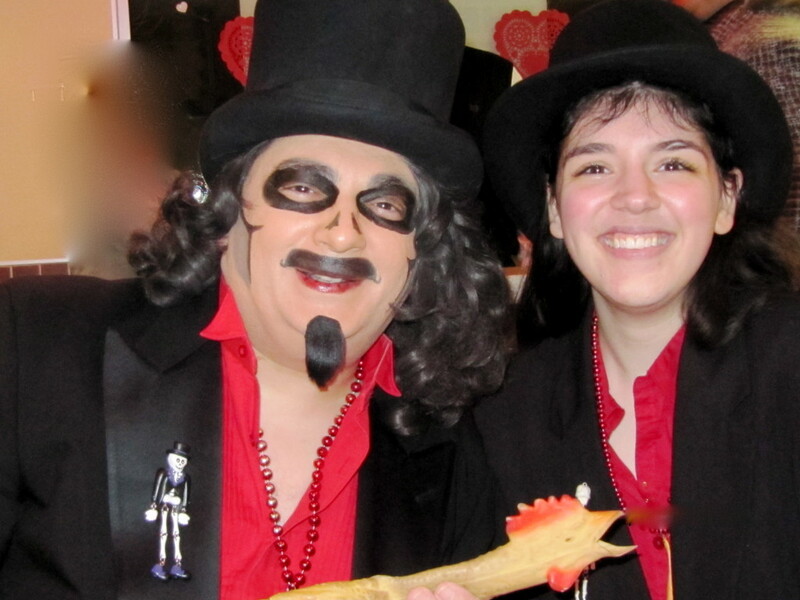 I’ve had the extreme good fortune of having the opportunity to meet Svengoolie and his “close personal friend,” Rich Koz, in person many, many times. Someday, I’ll probably go back and count all of my pictures from various Svengoolie public appearances, but for now, I lost count of how many events I’ve attended long ago. I still watch Svengoolie every week. On the occasional Saturday night that I can’t watch the show live, I still record it and watch it later. When I’ve had a particularly lonesome week, I feel like I’m watching a movie with a friend. (Yes, I know how television works: I know he’s not actually talking to me.) When I’m at school and suffering from a bout of homesickness, for those two hours, I feel at home. No matter what kind of week I’ve had, I get to smile, laugh, and have fun for two hours. And yes, sometimes I watch the movies during those weeks and think, Well, at least I’m not running from a horde of zombies! When school is in session, there has to be something very special going on for me to be anywhere else at any time between 9:00 and 11:00 pm on Saturday night. Svengoolie has become the special designated time every week when I finally let myself relax. (I know: relaxing during a horror movie sounds like an oxymoron.) The most “work” I ever let myself do during Svengoolie is reading or studying during commercial breaks. Svengoolie has introduced me to so many movies that I now consider to be among my favorites. I can probably count on one hand the number of movies I’ve seen Sven host that I had already seen outside of the show. But no matter what that week’s movie may be, I still watch, because Sven always makes it fun. So if you’re wondering what you’re going to do on Saturday night, allow me to make a suggestion: watch Svengoolie. It also won’t be long before you start encouraging your family and friends to watch, too––– just like I am now.